Save $15 when you book your tickets for the Tournament of Kings show. Just make your reservation online with this offer and the discounted price will show during the last step of the checkout process. Tickets start at $48 before taxes and fees. Excalibur's Tournament of Kings Dinner & Show features jousting, dancing, singing and a feast fit for a king. Don't miss this Medieval fare. Rates from $68 before fees/taxes and discount. General Admission tickets are $56 before taxes and fees: Ticket price includes a three-course dinner. Children 3 years and younger may attend free of charge and must sit on the adult's lap and share the adult's meal. All ages are welcome to this show. Children age four and older will be charged the full ticket price and receive their own seat and dinner. A unique dinner show transporting you back to the Middle Ages and the court of King Arthur. Knights in shining armor, fair maidens, an evil wizard and a medieval banquet make this an experience like one you read about in history books. Audiences of all ages enjoy this Medieval celebration of sword fighting, jousting, horse racing and gladiator battles. Dine on dragon’s blood soup and Cornish hen while King Arthur and his knights join you at their round table in the center of the arena. When the meal is over prepare yourself for battle. The knights engage in a rousing competition in which the audience must cheer or boo for their selected knight. Watch the knights unite to defend Arthur’s kingdom from the evil wizard in the midst of fire, smoke and fireworks. 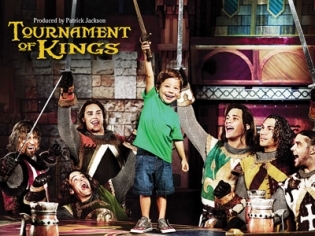 Tournament of Kings brings all the action from the movies right to your dinner table. Satisfy your appetite for adventure while eating with your fingers at this action-packed arena where you sing, cheer and bang on the tables all as part of the show! Overall I would give the SHOW an 8/10 but the food service was horrible.Coming from a person who’s been in working in the same industry for 10 years. their service is unacceptable. The food runner dropped a piece of potato that he was carrying from his plate to my son’s soup bowl which caused the soup to spill on my son. Everybody at our table saw what happened. the food runner immediately took off and left us. he didn’t bother to even help or apologize. Next when the server asked me a question if everything was alright( I decided not to give any tip because of what happened) he turned around and walked away while i was explaining SERVICE 0/10 We were sitting at Russia, front row. May 4th 8pm show. This show is so cool! Good for all ages, good food, and good entertainment. The actors never break character, its great! We really liked this show. We liked the horses. The sword fights were very unique too. The choreography was spot on. The food was delicious as well. This is a good show to see! The Show is really fun and the audience is super involved in the how. The kings really seem to have fun with their act. The horses very well taken care of. The food is basic, but has an authentic feel to. Remember this needs to be eaten with hands so do not expect gravy and seasoning and grease. duh! 1 waiter per section of 50 people. This show really takes you back in time! There is nothing like a medieval dinner and show! The portions were so huge – I felt extremely bad for throwing most of it away. There is no difference in size for a child’s portion vs adults. The show however was very entertaining and kept myself with my children hooked wanting more! I very much enjoyed The Tournament of Kings! The actors were excellent and the horses are clearly well trained and cared for. Our “king” showed tremendous affection for his horse, even going so far as to kiss him on the muzzle. Being an animal lover, it was great to see! The food was good, and the service was great. I wasn’t sure about eating without utensils, but it proved to be less challenging than I expected. And, contrary to the above post, we were not served baby chickens; they were small roasted hens. I’m guessing that person has never been served a whole chicken before. Have been to Vegas twice and have seen it both times. Plan on seeing this every time I go, dinner and a show for a reasonable price… Can’t beat it!! Nice clean entertainment! It’s a must! We had a great time and truly enjoyed ourselves!!! The show and meal were great considering the very reasonable prices of the tickets. I have been to Vegas twice. Both times I have seen this show. The food was good, and the show was good. I will probably see this show every time I go!! We went on our last trip to Vegas and had so much fun. Dinner was really good. Service was awesome and the show was so entertaining. Planning our next trip and will definitely watch again. Its good show but There meal is actualy a baby chicken, that bothered me alot. I would watch it again just for the meal. Loved the show too great acting and atmosphere. Where else can you eat with your hands and not worry about making a mess? This show makes you feel like you were a part of the whole Excaliber era. The kids had fun using no sliverware. The food was actual good. The show was entertaining. It was a show the whole family could enjoy. Nothing too violent, no harsh language. Just a good time out! Knights of the round table meets Vegas! This is great evening out for all. Any age can attend. We didnt know what exactly to expect. When I was served my food with no silverware, I knew we were in for a good time. The actors never went out of character. The acting was superb. The food was good. The show was fun to watch and see close up. Great show to see!